The list of Athlon Sports top 100 players in college basketball for the 2017-18 season is headlined by Michigan State sophomore forward Miles Bridges, who checks in at No. 1. Two true freshmen follow Bridges, but the remainder of the top 10 is comprised of savvy veterans who will lead teams with high expectations. Here are the first 50 players on our top 100-list. Be sure to check out Nos. 51-100 too. In the last quarter century, no high-major freshman has averaged 16 points, eight rebounds and two assists per game and decided to return to school — until Bridges. The Michigan State forward should enter the season as the clear National Player of the Year favorite on a team that could push for another Final Four under Tom Izzo. At 6'10" with freaky athleticism and a modern skill set, Bagley is a late game changer for college basketball. He can create shots on the block, get out and run in transition and even hit the occasional 3. He’s the clear-cut favorite to go No. 1 in the 2018 NBA Draft. A polished shooter and scorer at 6'10" who was the best senior in high school basketball last season. He can create and knock down shots at all three levels and is also a great offensive rebounder who will get dirty buckets. He’s good enough to lead Missouri to an NCAA Tournament berth this season mostly on his own. Saved his best for Big East play last year as he averaged 16 points and nearly five assists per game on an outrageous 67.1 true-shooting percentage. He’s the perfect point guard for Jay Wright’s scheme on offense, and he’ll take an even bigger step forward without Josh Hart around this season. A bona fide monster inside who continues to develop as an outside threat. The long-armed 6'6" center averaged 17.8 points and 10.1 rebounds in Mike Brey’s spacing-oriented scheme last year. He’s also a sneaky good defender due to his quickness, strength and active hands. The best true interior threat in all of college basketball — on both ends. He shot 59 percent from the field while posting comparable per-possession stats to All-American Caleb Swanigan. He’s also a menace on the block defensively due to his strength, and he forces turnovers with his remarkable motor, anticipation and hands. A polished scorer who will be relied upon as the Wildcats’ go-to guy. He averaged an efficient 17 points per game while also improving as a passer and giving better defensive effort a season ago. He’s a constant threat to get to the foul line and should continue to benefit from single coverage due to Arizona’s wealth of talent. The prototypical small-ball 4 in college basketball. He’s a matchup nightmare offensively who can take advantage of bigger players off the bounce to get to the foul line, or knock down shots from the outside over smaller defenders. Bluiett averaged 21.3 points per game during Xavier’s run to the Elite Eight last year. He might not be the best player in college hoops, but you can argue that he’s the most important. Berry is the engine that makes Roy Williams’ system go on offense, averaging 13.8 points and 3.2 assists during North Carolina’s NCAA run last year. As a senior, look for him to be the most consistent threat who gets the team’s transition attack going. After a monstrous sophomore season, Allen took a step back as a junior due to injuries and issues with tripping the opposition. Still, when this shooting guard is on his game, he’s an unstoppable offensive force on this level who can attack the rim aggressively and knock down shots from all over the halfcourt. 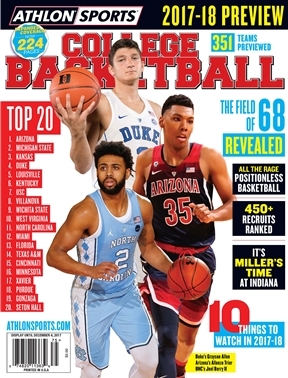 Athlon Sports' College Basketball magazine provides full team previews, schedules, conference predictions, national rankings, as well as complete 2017-18 NCAA basketball coverage. Click here to buy your copy today or visit your local newsstand! No player in college basketball has more pure talent than Ayton. At 7-feet with long arms and high-level athleticism, he looks like he was built in a lab to play basketball. He can score inside and out, block shots, and has great mobility. The freshman should be one of the best competitors in all of college basketball. Sexton is an elite-level shot creator and scorer. The point guard also showed improved passing ability late in his high school career. Without Frank Mason around, look for Graham to take the leap under Bill Self. He’s a pick-and-roll maestro who can both create for his teammates and knock down shots himself. He sets the tone for West Virginia’s aggressive press. Carter also averaged nearly 14 points, five rebounds and four assists per game last season. He’ll enter the year as a Big 12 Player of the Year candidate. Williams is a 6'9" pogo stick who might be the best shot blocker in college basketball this season. He also finishes (way) above the rim and has good touch around the basket. Always known as an elite athlete, the 6'5" guard added some ability as a lead ball handler to complement his jump shot in his freshman season. A double-double machine, Delgado led the NCAA in rebounding last season at 13 per contest. He also became a more diverse offensive weapon, showing off more advanced post moves as well as an improved passing game off the block. Duval possesses absolutely elite athleticism that allows him to break down defenses and get into the lane with ease. He’ll need to iron out some of the out-of-control tendencies of his game, but if he can harness his immense gifts, he could be an All-American as a freshman. After flirting with the 2017 NBA Draft, Alkins decided to stick around. He’s a tough, physical straight-line driver who improved as a shooter this past season while averaging nearly 11 points and five rebounds. At 7-feet with a monstrous 7'9" wingspan, Bamba swallows everything at the rim. He’s also a mobile, switchable perimeter defender and a good roller toward the basket. After the calendar turned to 2017, Shamet really figured things out. He averaged nearly 13 points, three rebounds and three assists while also posting outrageous efficiency numbers and minuscule turnover rates. One of the most underrated players in America last year. Maten averaged 18.0 points and 7.0 rebounds per game while somehow improving his efficiency despite taking on an increased offensive load. A matchup nightmare, Knox is another example of a prototypical 4 in the college game. However, it’s up for debate as to how much he’ll actually get to play there as a freshman. Spearheading Saint Mary’s efficient offensive attack inside, the 7-footer averaged nearly 17 points and 10 rebounds despite playing for one of the slowest teams in America. Finally past the barrage of injuries that befell him early in his career, Travis averaged 17 points and nine rebounds, with opposing coaching staffs commenting that he’s basically a brick wall inside. At 6'10" with a 7'3" wingspan, Carter is imposing inside. But he also is skilled with good footwork and great touch out to potentially the college 3-point line. A matchup problem who can both create off the dribble at the 3 and play as a small-ball 4. His game is well rounded, with athleticism and the skill to score, pass and defend. An elite athlete, Metu has added the ability to knock down shots from the midrange as well as create shots on the block in the last year. He’s also a game changer defensively due to his ability to protect the rim. He’s an elite offensive creator who can get shots for both himself and his teammates. Was the only player in the country to average more than 20 points and six assists per game last year. Allen is a killer shooter from deep and is developing as a creator for others. Without Kasey Hill this year, he should slide onto the ball a bit more and handle the point. Maybe the most athletic player in the country, Diallo is a highlight reel waiting to happen. If he’s taken steps to rectify a shaky jump shot this offseason, he has a chance to be a lottery pick. Foster will certainly put up buckets for the Bluejays this year as he always has. He averaged more than 18 points per game last season in the tough Big East, and he’s capable of creating shots off the bounce or off of screens. One of the country’s absolute best shooters, Daum averaged more than 25 points and eight rebounds per game while posting an outrageous 65.5 true shooting percentage. Will Bridges be the next Nova player to take the leap? He’s a terrific shooter and finisher, averaging 10 points, five rebounds and two assists per game last season. He needs to create more for himself this year without Josh Hart and Kris Jenkins around. Crawford is the only returning high-major player who averaged at least 16 points, five assists and three rebounds per game. He’ll be the major reason Wake Forest stays relevant despite losing John Collins. A jack-of-all-trades type who will be asked to step into a much larger role in 2017-18 with the departure of Caleb Swanigan. He’ll likely fit right into his natural small-ball 4 spot and continue with his ability to hit shots, unselfishly create for others and defend multiple positions. Wagner is an elite offensive weapon as a stretch-5 whose ability to space the floor not only allows him to efficiently score but also creates space for teammates. The biggest question: Can he slow down the opposition on defense? Coaches in the AAC rave about Gray’s ability not only to create looks, but also to make shots. The former junior college transfer averaged more than 20 points per game last year and is a threat to score from all three levels. A per-minute wonder last season who averaged nearly 14 points and seven rebounds despite playing under 20 minutes per game. He needs to stay out of foul trouble and work on his defense. The Mustangs lose a lot from last year, but Milton should be ready to take the reins on offense as a more involved lead ball handler. We know he can shoot and pass; the key is creating more consistent offense on his own. Holiday often was in the shadow of Lonzo Ball last year, but he’s capable of getting hot in a hurry and putting up points. He’ll also be UCLA’s best defender this season as he’s a dogged pest on the perimeter. Martin is a tough player to gauge. On one hand, few can put the ball in the basket at the rate he can. On the other, though, former Butler coach Chris Holtmann would sit him for long stretches, seemingly not trusting him. Will new coach LaVall Jordan feel differently? Few closed out the season quite as well as Battle, as he averaged more than 17 points per game over his last seven to build momentum toward this year. He’ll be counted on to be the Orange’s go-to guy this year. Farrell was one of the breakout stories of college hoops last year, averaging 14 points and five assists per game while playing an aggressive, constantly attacking style. The ACC’s Defensive Player of the Year in 2017, Lammers also brings a well-rounded offensive skill set due to his ability to post as well as hit midrange jumpers. Davis is an immovable monster inside with tremendous touch and high-level rebounding ability. Defense will always be a concern for him, but he’s well insulated next to Robert Williams inside. A terrific two-way player who can play both on and off the ball due to his shooting ability and passing acumen. He’ll be among the favorites for AAC Player of the Year while leading a Cincinnati team that will challenge for a league title. Weatherspoon just straight up gets buckets. He averaged nearly 17 points per game last year, dragging the Bulldogs toward respectability. A monster shot creator and shooter. Despite being Nos. 1, 2, and 3 on opposing teams’ scouting reports last year, Hall averaged more than 23 points per game on an obscene 63.4 true shooting percentage. Washington’s a true 4 in modern basketball who will be tough and physical inside while also occasionally stepping outside of the paint. He will put up points and rebounds in bunches in his freshman year.